Gripping mc story with jaw dropping twists! I know Katie Ashley can write some amazing romance so I was super excited when I first heard she was writing a motorcycle club (mc) romance. I may or may not have jumped this book to the front of my gigantic reading queue. It was worth it. Katie writes a sensational romance with twists that will leave you with your mouth gaping (I speak from experience). I fell in love with Willow Malloy first. The very first pages of the story are heart rending and I'm not ashamed to admit I had tears running down my face as I read it. I only fell further in love with her as the story progressed. Alexandra Evans was another character who stole my heart almost instantaneously. I loved how much she cared for Willow and was willing to go out of her way to do things for the little girl who needed her. Alexandra was one determined woman and I admired her. Deacon was somewhat of a surprise. He wasn't father of the year material, but he couldn't help it. Willow's existence was a total surprise to him and as the carousing second in command of a mc he was not remotely prepared for her. However it was how soon he came to care for Willow that won me over. Of course it doesn't hurt Alexandra is there to help smooth his transition from single guy to doting father, or that he lusts after her. The two had great chemistry. I enjoyed seeing them going back and forth. I must say when they finally gave in to the attraction they were feeling, I was surprised by how enthusiastically Alexandra dropped her proper teacher facade. The story is certainly gripping. There's so much going on and I almost forgot about the crisis that was coming. When things came to a head, I was shocked, but riveted in my seat. I couldn't stop reading. There were more moments of unchecked tears, some of even uncontrolled laughter, and plenty of disbelief. Honestly, this story is one ride you're going to have to read to experience. I can't wait to read more about the Hell's Raiders. I have a feeling a lot more laughter, swoons, and tears are in store for me. Loved this book. Very Graphic as far as torture scenes. Beautiful love story and gripping, raw characters. I will definitely read the whole series! Be prepared for the darkest, sexiest, most un-Katie Ashley like ride of your life. When I found out that Katie Ashley was doing an MC series, I almost died. They are my absolute favorite. What I wasn’t prepared for was the cocky alpha male that is David “Deacon” Malloy. Holy Moly! Deacon pissed me off, made me swoon and tore my heart out. I love, and I mean really love a flawed hero. I don’t want a man who is perfect. The more damaged, the better. Deacon is dark and damaged, yet he’s strong, confident and cocky. I love the path this story took. I really love that Katie Ashley stays true to herself, even with the dark subject matter. This you will understand when you read it if you’re a fan of her other work. The other thing I love about her books is the way she writes the females. Strong, confident, independent and full of sass. Alex is all of that wrapped up in a person who is perfect to go up against the biker who doesn’t love, leads an outlaw life and has no clue that his life is about to be flipped upside down. Hot, dark, deep and absolutely brilliant. 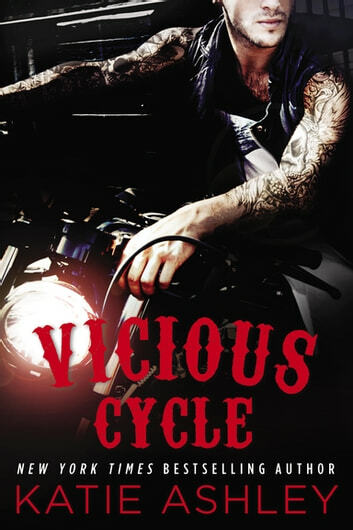 I love Vicious Cycle and can’t wait for Redemption Road. Fell in love with Willow first of all felt for that little girl, her Dad Deacon never knew what hit him between her and the teacher. Every one needs some one stronger than them even if that comes in a pint sized package, I can imagine his face doing the "girlie stuff"